The pituitary gland is also called the hypophysis. The pituitary is about about 1 centimeter in diameter. 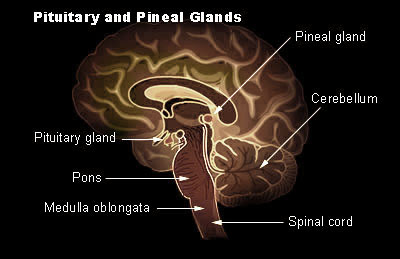 The pituitary gland is almost completely surrounded by bone within the skull as it rests in the sella turcica. The pituitary can be subdivided into the adenohypophysis and neurohypophysis. The adenohypophysis can be further subdivided into the pars distalis, pars intermedia, and pars tuberalis. The pars distalis is the anterior lobe of the pituitary. The adenohypophysis is regulated by releasing hormones from the hypothalamus. The adenohypophysis (more specifically, the pars distalis of the adenohypophysis or anterior pituitary) secretes tropic hormones. On a histology slide, it is apparent that there are several cell types in the pars distalis of the adenohypophysis (anterior pituitary). The cells of the pars distalis (anterior pituitary) can be classified as acidophils or basophils depending on their affinity for acidic histology dyes or basic histology dyes, respectively. The acidophils are the somatotropic cells and the lactotropic cells. Thus, growth hormone and prolactin are secreted by acidophilic cells. The basophils are the gonadotropic cells, corticotropic cells and thyrotropic cells. Thus, the basophils secrete FSH, LH, ACTH, and TSH. Histology hint Sarah Bellham: there are two mnemonics to use when thinking of acidophils and basophils of the anterior pituitary. "GPA" (growth hormone and prolactin are secreted by the acidophils). "B-FLAT" (basophils secrete FSH, LH, ACTH, and TSH). Growth hormone stimulates the growth of bones, muscles, and other organs. Thyroid stimulating hormone (TSH) stimulates the thyroid gland to secrete thyroid hormone. Adrenocorticotropic hormone stimulates the secretion of hormones from the adrenal cortex. FSH and LH regulate the ovaries or testes. Prolactin hormone fosters the development of the female breast during pregnancy as well as milk production during lactation. The neurohypophysis can be further subdivided into the pars nervosa, infundibular stalk, and median eminence. The pars nervosa is the posterior lobe. The infundibulum connects the pituitaryto the hypothalamus. The neurohypophysis is regulated by nervous stimulation. The posterior lobe of the pituitary secretes two hormones: antidiuretic hormone (ADH) and oxytocin. Oxytocin causes uterine contractions. Oxytocin also stimulates "milk let down" from the lactating breast.